As this year's crop of Ireland U-20s prepare for their final competitive game on home soil, they will do so with plenty of regrets, but also safe in the knowledge that they have learned a lot. Friday night's clash against a Scotland team who caused a major upset by beating England last time out, will provide Noel McNamara's youngsters with a stiff test before they round off their Six Nations campaign in Coventry next weekend. With a Junior World Cup to come in June however, there is still plenty to play for this year. Finishing the campaign on a high is hugely important but planning for the summer is equally so. The Six Nations has been a major learning curve for the players and coaches alike, and while there have been improvements from game-to-game, Ireland have yet to fire on all cylinders for a full 80-minutes. They have been drawn in a very tough World Cup pool, with the ever-improving Georgians, South Africa and hosts France, who beat McNamara's side last month. The tasks don't get any easier from here on in, which is why a win at home to Scotland is imperative for the confidence levels of the players. They have already shown that they are a major attacking threat, but defensive lapses have been extremely costly. That has been the big focus at training since Wales condemned Ireland to a second defeat last time out. For Paul O'Connell these last few weeks have given him further insight into what life is like on the other side on the touchline, and for the most part, it has been a very enjoyable experience. As he is finding out quite quickly though, it is one thing having an opinion as a pundit, on what is going wrong with a team's system, but it is another to try an implement a strategy to fix it. "I do think attack is the hardest part of the game to coach," O'Connell maintains. "I think defence is a lot more black and white. For us, we've just faltered in a few parts defensively. "Our maul defence has been poor. Our five to 10 metre defence in the lineout has been poor. Then we have just given away a few howlers. "Last week, a turnover off a kick off. Another kick off, same try as well that we conceded. I don't think it's a case that we have put less emphasis on the D, we've just slipped up in concentration a few times and it's hurt us. "But I do think attack is the harder part of the game, so we have gotten better at the harder part. The defence now, is hopefully something we can tidy up and that can start this weekend." Conceding tries from a maul will be a major bugbear for O'Connell, who prided himself on that kind of work as a player, but he knows that this age-grade is all about the players learning and from what he can see, they are improving. "I think we've probably had lapses in concentration and lapses defensively," the forwards coach continues. "I think we play really good rugby and we're capable of scoring tries, we just have stop being so capable of conceding them as well. "We've conceded on maul a few times which is pretty disappointing and we've failed to score off a maul as well which is disappointing. If you reverse that stat, we'd be in a far better place. "I don't think focusing on putting in an 80-minute performance really makes you any better, you've got to focus on the little fixes that led you to conceding in the games like we did. "It is a learning curve and you're trying to get as much done in a short period of time and sometimes the more you do, from my experience as a player, sometimes the more you try and gel in as a coach, the more difficult it is to perform and play because you've so much going on in your head. "I think trying to give them a little bit of information which can make a big difference and giving them information that they're still able to play and use their talent and their speed and their power which they have in abundance - that's the challenge of the job. "There's so many things you'd love to say to them and give them and knowledge you'd love to impart, but it's a question of trying to do the right amount so you don't knock them off their game as well. "I think if we make these guys better players, we have a better chance of winning. If we give them better habits, we have a better chance of winning. "I do think we have done that. It probably hasn't showed in some of the results but I do think a lot of these guys will have a lot of good habits coming out of this Six Nations period. "Hopefully they maintain those for the next months after that then, and we head into the World Cup as a far better team, with far better players than we had. "I think if you make them better players, better coached, better understanding of how we want to attack and how we want to defend, it should lead to results, or at least better performances anyway." Communication has also been an issue at times as players begin to find their voices at a level that is a massive step up from anything they have played at before. Having in been in camp for several weeks now, there is an onus on them to show that they can right the wrongs in a short space of time, however O'Connell also accepts that some of that responsibility lies with the coaching staff. "A lot of these guys are naturally quiet and they will grow into very good leaders," he adds. "We already have a good handful of leaders. A lot of it is down to the clarity we can give them. The more clarity we give them as coaches, the easier they will find it to talk about it and communicate amongst each other. "The pressure is on us there, in that regard defensively, to make it easier on the players." 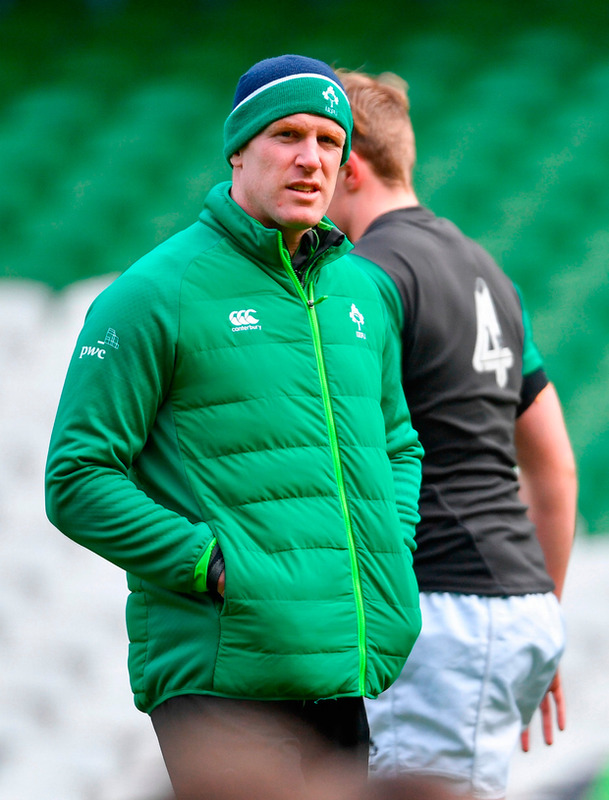 While the Six Nations Championship may be beyond Ireland's reach at this stage, there is a degree of pressure on the both the coaches and the players to get a positive result at Donnybrook. At this level, leeway is given, but behind the scenes, O'Connell will be driving the fact that once a lot of these players make the step up to the next level, the environment is far less forgiving.